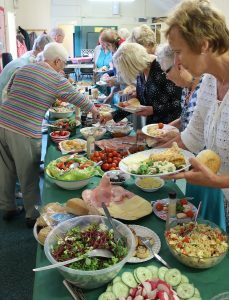 Today was Castle Green WI’s annual Pot Luck Lunch. It was a well attended event with some 50 WI ladies and their guests arriving around midday – luckily just before the rain began to fall heavily after weeks of drought. 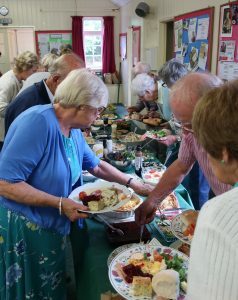 The food that had been prepared and brought by our members was laid out on a very long table, along with another table for the ever popular raffle prizes. 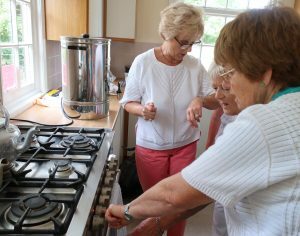 There was a slight problem with lighting the oven to warm some of the desserts, but we now know how many WI members it takes to do that task ! 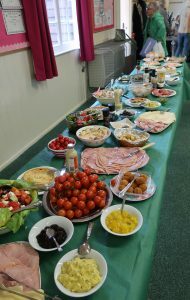 Then our president invited members to come up and fill their plates, which they all did with great enjoyment. When everyone had finished the table was cleared and delicious deserts were laid out with coffee and tea being served to finish the lunch. 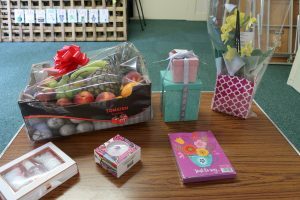 Raffle tickets were drawn and prizes chosen and Kate closed the meeting by wishing members a happy Summer. Kate has delivered over 300 Poppies that were either knitted or crocheted by our members to the Scouts with many more being given to Kent Floral Association via Mary Wheatley.